Military operations must be “lean and mean” to remain efficient. 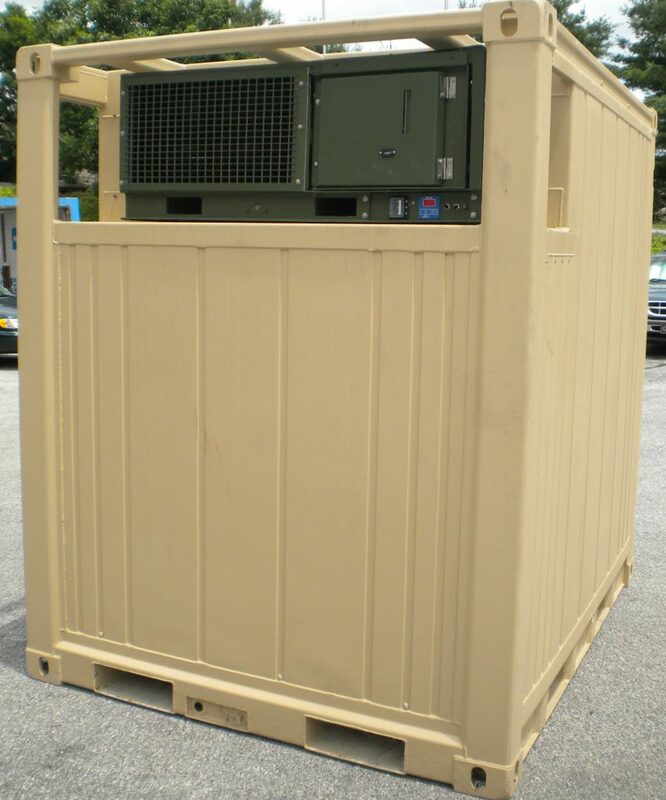 The one-piece design of our tricon containers offers the convenience and portability that military units require. Housing the condenser and evaporator in the same section makes the tricon container easy to handle and transport. This also simplifies the setup of the unit — there is no complicated assembly process that requires an extensive use of personnel that could otherwise be performing more urgent military-related tasks. Additionally, the one-piece construction provides the simplified operation and maintenance that meets the needs of military applications. There are fewer moving parts that could malfunction or wear out. You will also appreciate the tricon’s versatility — you can configure it with up to two more units if needed. The tricon’s dimensions when combining three units equal the footprint of one 20 ft. container. Military units are often asked to establish bases of operation in challenging climatic conditions such as extreme heat or cold. Consequently, we’ve designed and constructed our tricon containers to perform in all types of environments. The wide temperature range means the tricon container can keep MREs and other food refrigerated or frozen to prevent spoilage and extend their shelf life. You can also use the tricon container to store ammunition to lower the risk of damage or malfunction that can occur when storing it for long periods of time in excessively hot or cold environments. The ability to use the tricon container as a refrigerator or fridge can also provide cost savings for military units. It may eliminate the need to transport and deploy two containers in some cases. This also introduces an element of convenience and helps military units achieve their objective of remaining mobile and nimble. Mobility and versatility are essential for military operations that are constantly on the go. The military sets high standards for the equipment it provides for its troops in areas such as quality, safety, durability and performance, and we hold our tricon containers to the same standards. We’re proud that our refrigerated triple containers adhere to these stringent specifications. For instance, the materials we use to manufacture the tricon containers comply with MIL-PRF-32349, and they also meet the requirements concerning material deterioration, prevention and control. You can use our tricon containers in the most demanding environmental and climatic conditions with total confidence. Klinge is an undisputed global leader in the design and production of specialized transport refrigeration equipment for the military and industries such as oil and gas, meat processing and pharmaceuticals. Founded in 1984, we have developed a reputation for providing high-quality, low-maintenance containers and related refrigeration products at competitive prices. We also have the facilities, equipment and expertise to design and build customized refrigeration containers to precise technical specifications. No matter what refrigeration challenges you face, you can count on Klinge Corporation for the best solution for your short- and long-term needs. Contact us to learn more about our tricon containers today. » SAFETY – Intended for use in potentially explosive atmospheres. Complies with Zone 2, Group IIA Hazardous Locations, which is comprised of an air mixture of gases, vapours, mists or dusts; which can ignite under certain condition. » CONVENIENCE – Unit is conveniently one piece. The condenser and evaporator sections are housed in the same section. » ACCESSIBILITY – Unit is accessible from the front of the tricon and controls are placed to allow for ease of operation. Electromechanical components are placed near the front of the unit to allow for easy maintenance and servicing. » EFFICIENCY – R134A is used in order to ensure proper cooling at a wide range of temperatures. At an extreme range of temperatures, R134A is the most efficient refrigerant. In the event of a possible leak, other refrigerants will leak before R134A thereby becoming less efficient. » When three are adjoined, the footprint is that of a standard 20’ ISO container. » Ultimate versatility—the tricon can be transported by itself when configured with 2 other tricons. Klinge’s machinery complies with International Customs Regulations for Containers, relevant ISO recommendations, and the rules of B.V., ABS and Lloyds.